CLICK HERE TO JOIN THE QUEST! The game begins when you join up with a group of students who, with an able guide named Tia, must follow a map, face dangers, overcome obstacles, collect three magical jewels, and try to locate the missing magical Golden Calculator. You, along with the students, are vying to become the apprentices of a famous master craftsman. 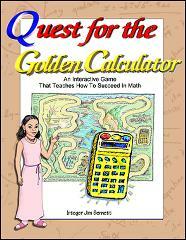 Solve math puzzles, secret codes, hidden messages, mazes, and word search challenges. The adventure, patterned after the novels of C.S.Lewis, is rich with symbols and allegory. Can you complete the Quest? Can you find the missing Golden Calculator? Will you win one of the prizes to be given away to a lucky winner? The story, which is divided into 25 short episodes, has a problem that must be solved in order to advance to the next level. As you progress toward your final goal, there is an option for saving what you have done at the start of each episode. Teachers: this is an excellent SMART Board activity. 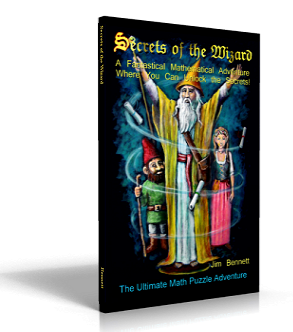 "Secrets of the Wizard" - the ultimate math puzzle fantasy. 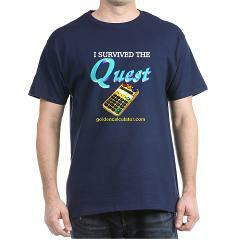 "I survived the Quest" t-shirt. 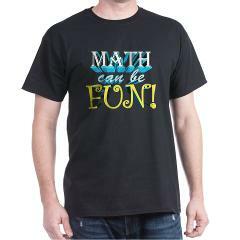 "Math Can Be Fun" t-shirt. 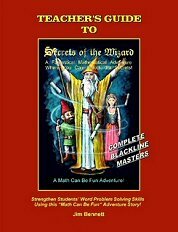 "Teacher's Guide to Secrets of the Wizard" - the ultimate math puzzle novel. 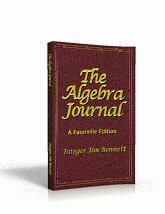 "The Algebra Journal," a fascimile copy of 210-page handwritten and illustrated journal that looks ancient. CLICK HERE to see preview. Secrets of the Wizard is a fantasy adventure for anyone (age 12 and up) who loves solving math puzzles. It tells the story of the good wizard, Galimedes, and his two faithful helpers as they try to recover the lost scrolls of time and seasons that were stolen by the evil magician, Zarvildar. The story is packed full of action and suspense. The pages of the story are scrambled and renumbered (so only the worthy will gain access to the secrets). Indeed, only by solving the math puzzle on each page will you know the number of the page to read next. There are 99 math puzzles altogether! There is also a hidden secret message which you can spell out by stringing together the first letters on each of the pages when they are read in the correct order. This message will reveal the wizard’s greatest secret. There is an appendix with hints and a second appendix with the answers written in a simple substitution code so that a quick peek is not likely to reveal the answers. The author's goal is to combine math puzzles with a great story that will keep you on the “edge of your seat.” There are frequent "cliff-hangers." Only by solving the math puzzles will you find out what happens next. Secrets of the Wizard should be of tremendous interest to anyone who enjoys fantasy stories and/or the challenge of solving math puzzles. Teachers and tutors who need enrichment materials as well as parents who want to encourage their children's interest in math will find this book to be a great resource. Jim Bennett, AKA “Integer Jim,” is a semi-retired middle school math teacher. In addition to being an award-winning math teacher with 36 years experience, he is an acclaimed artist and writer. He previously wrote Calligraphy For Dummies, Calligraphy for Creative Kids, and The Algebra Journal. Jim grew up in Virginia during the civil rights era when the schools were first integrated. His new book, To Catch a Tiger, describes the conflicts involving racism and other forms of prejudice. In 2003 he was named Educator of the Year by the Southeastern Ohio Art Education Association. He has also developed a number of math lessons based on the Bible. His website is mathsquad.com. Permission to copy and distribute for non-commercial purposes is hereby granted. There are magical math puzzles, mazes, secret codes, hidden messages, and word search challenges. You could be the winner!